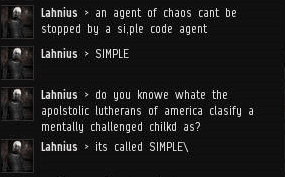 Previously, on MinerBumping... Lahnius shed whatever humanity he had left and embraced his new identity as an "agent of chaos". His first act as an agent of chaos was to deliver endless monologues in Nakugard local chat. Becoming an agent of chaos gave Lahnius a sense of power and freedom that he hadn't experienced in a very long time. But it came at a cost--it was consuming him from the inside out. 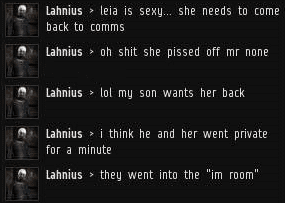 No one seemed to like the new Lahnius. Granted, they didn't like the old Lahnius, either. Still, the Nakugard locals were now even less willing to speak with him. Being an agent of chaos was lonely, so Lahnius threw himself into his work. His latest project was to pretend that he was having TeamSpeak conversations with various Nakugard residents. 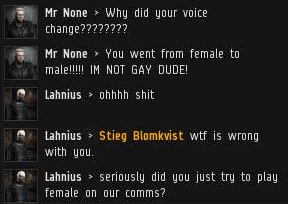 It had been a long time since anyone other than Lahnius had said anything in local chat. 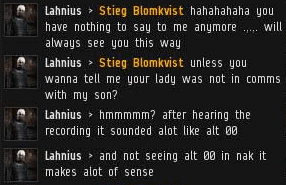 So Lahnius resurrected his alt, Mr None, and chatted with him. It was the first sighting of any of Lahnius' alts since they lost their Navy Scorpions in an ill-advised battle with Failed Diplomacy. 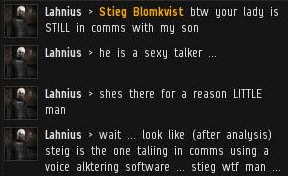 Lahnius continued to carry on a chat with his alt. He was desperate to get a reaction of any kind from anyone. 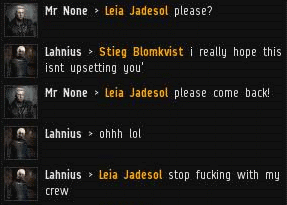 It's unclear why Lahnius was so fixated on Leia Jadesol, who was most likely AFK. Regardless, the agent of chaos persisted. Hour after hour, Lahnius polluted Nakugard local, talking almost exclusively to himself. 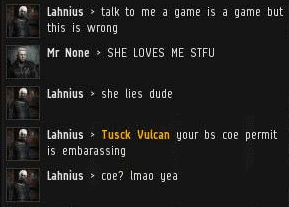 For all his words, Lahnius was no closer to defeating the mighty CODE. alliance. 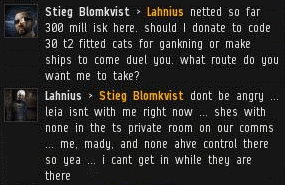 With no sign that his imaginary TeamSpeak plot was having the intended (or any) effect, Lahnius tried pulling other random players into his web. Finally, Stieg Blomkvist broke his silence. For a brief moment, someone other than Lahnius actually said something in Nakugard. But had the agent of chaos' efforts truly been rewarded, or had he merely supplied his mortal enemy with more Catalysts? Of course, Lahnius had no intention of engaging in spaceship combat with Stieg. That was out of the question now. 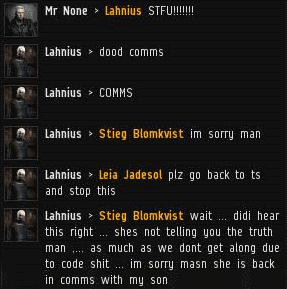 Lahnius was running a strictly chat-based resistance to the Code. Lahnius had been furious at Trump, and he grew even angrier when other Agents incessantly urged him to return to TeamSpeak. Now, weeks later, Lahnius was replaying the humiliating incident in his mind. However, in his power fantasy, the victim imagined the scenario playing out in reverse: Through his alts, Lahnius could pretend that he was the one humiliating CODE. members and their allies--or anyone else he didn't like. And, of course, Lahnius' thirst for revenge always drew him back to Agent Alt 00. Was there even a remote possibility that Lahnius might purchase a mining permit, like Alt 00 wanted? Or would the psyche of the agent of chaos continue to disintegrate in Nakugard local chat? 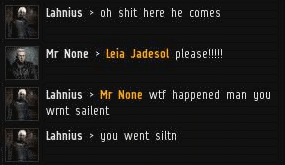 This Lahnius guy is either high, or brain damaged, or both. I don't recall shardani ever having as much stuff written about him. Well except for the newspapers telling the world that he had killed his child because he could not stop the ganks. Can somebody throw the minerbumping parrot some crackers? 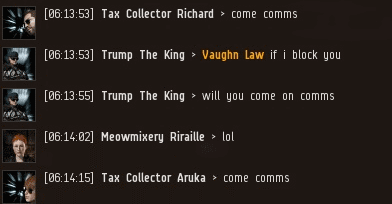 Maybe it's time to tell CCP about this guy. Seems liable to pull a Shardani at any moment. Apparently he has a "lady" and now a son. I think his family is imaginary. That guy suffered brain damage from talking to loyal. It's obvious by this guy's verbosity it is one of Jamey's alts. Created to provide grist for this blog.